Good Morning, this is Capital Essence’s Market Outlook (the technical analysis of financial markets) for Wednesday February 13, 2019. Stocks closed higher Tuesday as optimism that U.S. lawmakers reached a tentative agreement to prevent another government shutdown helped fuel broad-based buying interest. For the day, the S&P climbed 1.3 percent to 2,744.73. The Dow Jones Industrial Average rose 1.5 percent to close at 25,425.76. The Nasdaq Composite advanced 1.46 percent to 7,414.62. The CBOE Volatility Index (VIX), widely considered the best gauge of fear in the market, fell more than 3 percent to 15.43. Bank stocks attracted strong buying support Tuesday led by gains from Goldman Sachs, Citigroup and Morgan Stanley all rose at least 1.6 percent. Bank of America and J.P. Morgan Chase also gained at least 1 percent. As such, the SPDR S&P Regional Banking ETF (KRE) rose 1.04 percent on the day and is up more than 18 percent YTD, outperformed the S&P. Now the question is whether the rally has more legs? Below is an update look at a trade in KRE. Our “U.S. Market Trading Map” painted KRE bars in green (buy) – see area ‘A’ in the chart. 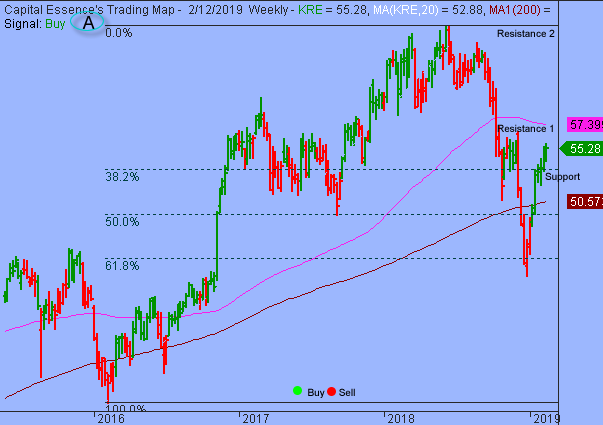 KRE has been on a tear in recent months after the late 2018 selloff found support near the 61.8% Fibonacci retracement of the 2016-2018 upswing. Last week’s rally pushed the ETF above the 38.2% Fibonacci retracement, a key technical level based on Fibonacci levels. This week’s upside follow-through confirmed the bullish breakout. This is a positive development and opened up for a test of the more important resistance near the 57 zone. A close above that level has measured move to 66, or the 2018 highs. KRE has support near 53. Short-term traders could use that level as the logical level to measure risk against. Short-term technical outlook shifted to bullish (buy). 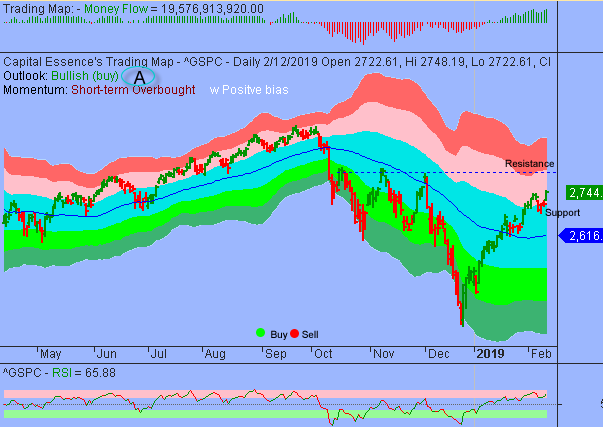 Last changed February 12, 2019 from bearish (sell) (see area ‘A’ in the chart). As for support, 2700 is the line in the sand. The path with least resistance remains higher unless there is a close below that level. Short-term trading range: 2700 to 2800. S&P has psychological support at 2700 while key support is at 2677. The index has resistance near 2744. A sustain advance above that level has measured move to 2800. In summary, S&P cleared key resistance Tuesday, signified the one-week congestion pattern had resolved itself into a new upswing. Nevertheless, it will be important to monitor the retreat and rebound behaviors over the next few days to determine whether breakouts are decisive.